Michael was born on 2 Jul 1820 at Ford Forge, Berwick upon Tweed, Northumberland to parents George Clarke and Matha Middlemass, who were both Primitive Methodists. When aged about 15, Michael was attending a PM chapel about five miles from home with his parents. There he heard a lecture by William Fowler on Temperance which produced a powerful impression on him and he immediately took the pledge. Shortly afterwards he was converted through the ministry of Samuel Butterwick. He soon became a local preacher. Michael accepted a call to ministry and while he was in demand as a popular preacher, he struggled with his own feelings of unfitness for the work. He worked through this and in his second circuit was a part of a wide spreading and genuine revival. In 1853 he offered to John Petty that he was willing to go anywhere and that year was appointed to Australia. On arrival in Victoria, Australia, Michael took the place of John Ride, who had superannuated. During his five years in Melbourne membership increased from 186 to 687. 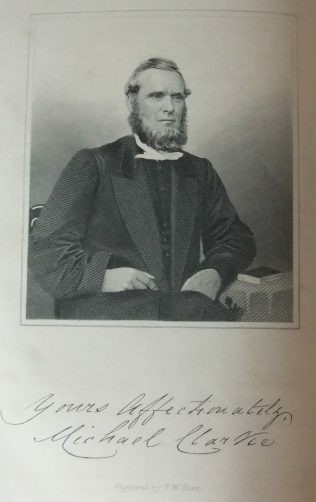 He returned to Melbourne in 1874 to take up the roles of Book Steward, General Secretary and Superintendent of Missions. During his vist back to England, Michael attended the PM Conference at Leeds and was elected Vice President in recognition of his missionary activities in Australia. Michael married Jane Smith (1823-1901) on 10 July 1849 at Sunderland, Co Durham. Records show eight children. Michael died on 15 September 1892 at South Yarra, Victoria, Australia.